View of the Great Gate at Trinity College, Cambridge. It was built in the early 16th century. It is in a similar style to King Edward's Tower built in 1428-32, which was one of the first of Cambridge's tower gatehouses. Unlike other gatehouses it has a separate pedestrian entrance on the east side. 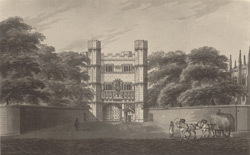 It is decorated with an elaborate niche, which can be seen in this print, holding a statue of Henry VIII.